A few weeks ago, MALKA Diamonds & Jewelry acquired an entire case of Vintage & Antique jewelry. The collection is filled with pieces dating back to the Victorian, Edwardian & Art Deco era. You can't help but wonder who had these pieces before they came to MALKA Diamonds in downtown Portland. 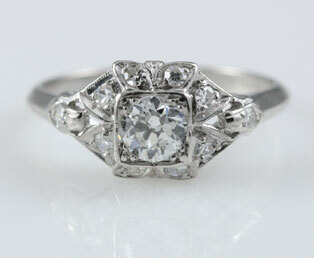 Yesterday, a customer purchased an Art Deco engagement ring. It was a squared-bezel set which showed off the geometric influence of the era. Inside an inscription of R & J 1924 was found. At that point we couldn't help wondering who would have our rings in 90 years from now. Come in anytime to take a look at this historic case.